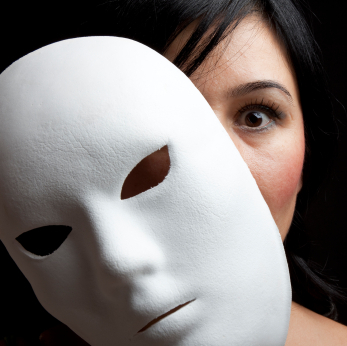 Article: Why Am I Afraid to Tell You Who I Am? Coaching: There are a few spots still available. 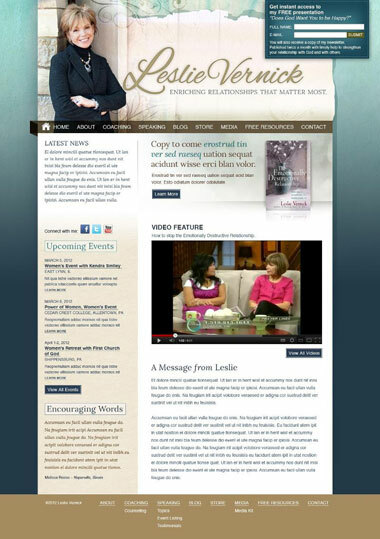 Sneak Preview: Leslie's new website is coming soon! Am I Being a Bad Example? FYI, once I switch to my new website, I will also be switching to a new delivery system for my newsletters, and you will need to resign up if you still want toreceive them. I will post instructions on how to do that in my upcoming newsletters, but you must re-register to remain on my mailing list. Plus you will get a wonderful gift for re-registering--a downloadable presentation with slides answering the question, Does God Want me to be Happy? I am also going to be running a contest to name my newest book. Tentatively it's titled The Emotionally Destructive Marriage, but I fear that title will get confused with my current book, The Emotionally Destructive Relationship so I'm searching and praying for a new title and subtitle. There are no guarantees the Publisher will approve the new title, but I'd really like to rename it something strong, and usually they use what I suggest. So friends, I'm challenging you to come up with a title and/or subtitle for this book. I will be running this contest for the next few months so you have plenty of time to give it some thought, and you can enter as many times as you'd like. In September, I will put the suggested titles in the newsletter, and the one that receives the most votes will receive an autographed copy of the new book (when it comes out) AND three (3) 45 minute coaching sessions valued at over $500. to Tell You Who I Am? I can't count the number of people I meet who can't be honest with their spouses, friends, colleagues, and family members because of fear. They fear conflict, rejection, and disapproval, and are terrified of losing their relationship if they really let someone know what they want, think or feel. We all struggle with hiding our true selves from others. We pretend something doesn't matter to us when it does matter. We do something we really don't want to just to avoid conflict. We act happy when we're hurting. We say something doesn't bother us when our blood is boiling. We pretend we're not as smart or talented or as resourceful as we are so we don't threaten a person's ego. We act as if we're more spiritual than we are so others will like us or look up to us. We get so good at faking it, that we forget who we are and what we're passionate about. Instead, we morph ourselves into whatever we think others want us to be just so they will like us or want to be with us. In the process, we forfeit the joy of being known and accepted for who we are. We smile on the outside and begin to shrivel up on the inside. We become pleasers, pretenders and peacekeepers, often feeling stressed out, burned out and emptied out. This leads to isolation, loneliness, discontent and depression. Not only that, when we live for the love and approval of others, we lose out on becoming the person God designed us to be. 1. Get honest with yourself. Part of the reason you can't honestly share yourself with others is that you've been hiding even from yourself. You don't know who you are, what you feel, what breaks your heart or what thrills your soul. You've been so busy being whatever you think other people want you to be or just being too busy, you've lost you. 2. Place your identity and security fully in God's love and acceptance of you rather than people. When we know (really know) that God has our back and that we're deeply loved and fully known, people aren't that scary. That doesn't mean we don't need people to value and love us, but we are free to be ourselves with them. 3. Learn to tolerate the unpleasant feelings that come when we disappoint someone or there is conflict. It happens to all of us, but, when we can tolerate them without caving into them, they eventually go away. When we stop pretending and start to speak honestly about who we are or what we can or can't do or what we want in our relationships, we always feel awkward and uncomfortable because we're not used to being real or disappointing people. Don't let those feelings stop you from making the changes to get honest. Most people feel a little foolish when trying new things. In order to stop hiding, you have to learn to speak the truth in love so that there is an opportunity for you to be known and for mutual caring and understanding to be expressed. Some of you may realize that your relationships are very lopsided. Perhaps you're afraid that if you stop pretending that you like this arrangement, the taker in the relationship won't hang around. You may be right. On the other hand, your honest talk might also be just the impetus he or she needs to change and start learning how to give back and think of someone else for a change. That would be good for him (or her), good for you, and good for your relationship. The writer of Ecclesiastes reminds us of the blessings of healthy relationships. If you're having trouble being honest in your relationships and need some extra help, you may find personal coaching is a great next step in your own growth and development. Few pastors or Christian writers have dared to approach the subject of how proper eating and an active lifestyle can affect how we serve God. Author Gary Thomas does just that. And he reaches all the way back to the apostle Paul, who wrote that we need to prime our bodies to become, 'an instrument for noble purposes, made holy, useful to the Master and prepared to do any good work.' To illustrate the body/soul correlation, Thomas presents engaging and diverse stories that make a direct connection between the physical challenge and its spiritual consequence. This book is a must read for anyone seeking new and compelling motivation for strengthening their bodies and fortifying their souls. by Friday, May 18th for a chance to win one of two copies! Congratulations to Crystal C. of Mechanicsburg, PA and Dana P. of Kansas City, MO who were the two winners of Poppy Smith's book Why Can't He Be More Like Me. Thank you again for your workshop presentation and participation at the PASCH Conference. The feedback has been excellent, with many attendees mentioning the inspirational and educational value of the event. Outstanding! The highest rating overall. Underneath and foundationally massive changes have been taking place in my life and more importantly in my understanding of the problems and limitations within which I am functioning. This little note does not adequately express my gratitude to God for putting us together and to you for your help and what you have done for me, so far. Tom, a 40 something professional in a difficult marriage. Leslie's questions really helped me clarify my understanding of my life purpose, and the next steps for my life. Now I am writing a book called FIELD MINISTRY: How to Know When You're Ready to Move From the Pew to the Harvest. Get ready to grow emotionally and spiritually when you work with Leslie. And thank you Leslie for using God's gifts to you! Question: I separated from my husband after 25 years. I can remember being pregnant with my now 22 year old son feeling distraught and asking myself why I am having this man's baby? The emotional destruction took place throughout 22 years of the marriage. I have asked numerous times to go for counseling and actually moved out twice only to come back to empty promises of change from him. I feel a sense of peace in every cell of my body that I have not felt in decades. My concern is am I honoring God with my decision for self-preservation, my sanity? Am I being a poor example of Christ to others by my decision? Answer: Your question captures the dilemma so many women who are in an emotionally abusive/destructive marriage experience once they prioritize their sanity and safety over keeping the marriage together. They fear God's anger and his disappointment. They fear being a poor representative of Christ and feel guilty when they finally say "I can't do this anymore." I deeply appreciate that you don't take your marriage vows lightly. We ought to press pause for self-examination, prayer and Biblical counsel if ever we consider separating from our spouse, so that if we separate, we are separating for biblical reasons and have as clear a conscious as possible. In another example, when Jesus was born and King Herod sought to exterminate all the Jewish babies two years and younger, God told Joseph in a dream to flee to Egypt until it was safe to return (Matthew 2:13-15). When Rehab hid the Jewish spies, she lied to keep them safe, and God commended her (Hebrews 11:31). I suspect those who lied to keep Jews safe from the Nazi army were equally commended by God. Jesus himself valued safety and said that even the well-being of an ox was a higher value to God than legalistically keeping the Sabbath by not working (Luke 14:5). Safety is an important component of trust, especially in marriage. There can be no freedom or honest communication if someone feels afraid or is threatened either physically and/or emotionally or has a price to pay whenever they honestly share their thoughts and feelings. Women (and sometimes men) fear taking measures to protect themselves because they've been taught it's unbiblical or ungodly. They suffer endlessly with verbal battering, even physical abuse, believing that by doing so they're being godly martyrs. Keeping the family together at all costs is seen as God's highest value. Yet Proverbs 27:12 teaches us, "The prudent see danger and take refuge." Sanity is also an important value to God. By sanity I don't just mean good mental health from a secular point of view, but good mental health from God's point of view. Again the writer of Proverbs warns us of the devastating consequences of living with a contentious and argumentative person (Proverbs 15:4; 17:1; 25:24; 26:28). The scriptures are clear. People influence and impact us both for good and for evil. When we live with an abusive, destructive, manipulative and/or deceitful person, it definitely takes its toll on our mental, spiritual, emotional, physical and spiritual health. Being sane from God's perspective involves knowing, believing, and walking in the truth. Jesus says, "If your eye is good, your whole body is filled with light. But when your eye is bad, your whole body is filled with darkness. And if the light you think you have is actually darkness, how deep that darkness is (Matthew 6:33). The apostle Paul says by nature we exchange the truth of God for a lie and that the more we do that, we become more and more insane (depraved mind) (Romans 1:25-28). Walking in the light and truth are important values of God. When you live with someone who prefers deceit and darkness and who twists and manipulates the truth, it can be very stressful. However your question is "are you being a poor example of Christ to others by leaving?" My answer is maybe. You also could be a poor example of Christ by staying. You see, it's not whether you leave or stay that determines whether you are letting the love of Christ rule you, but how you leave or how you stay. There are people who choose to stay in a destructive marriage (for lots of reasons) and are terrible examples of Christ. They are bitter, angry, spiteful, depressed, resentful and demonstrate no joy, peace or hope in their countenance. Likewise, those who leave a bad marriage can also leave with those same negative emotions in control rather than Christ. So, what would it look like to be Christ-like and God-honoring even while leaving a destructive marriage? Here are a few thoughts for you to ponder. The apostle Paul says that we're not to only look out for our own interests but also to look out for the interests of others (Philippians 2:4). You are looking out for your interests for safety and sanity by leaving. That's not ungodly or sinful. But if you want to be a godly wife, you must also look out for your husband's interests. So what is your husband's greatest need right now? Is it to stay with him, make his dinner, be his companion and meet his sexual needs, or is it something far more crucial to his long-term well-being? I believe your husband's greatest need right now is to wake up from his slumber, from his darkness, and to come to Christ and repent of his destructive behaviors. The question you must answer is "would you more likely help meet his greatest need by leaving or by staying?" Secondly, God calls you to love your husband, even if he feels like your enemy right now. That is being Christ-like. However, you must also understand that unconditional love doesn't entitle someone to unconditional relationship even with Jesus. The scriptures tell us that our sin separates us from close relationship from God. It doesn't separate us from his love, as Paul tells us that nothing can separate us from God's love (Romans 8:38,39), but it does separate us from his Presence. If Jesus doesn't offer unconditional relationship with everyone even when he loves them, I don't think he expects that of us either. Sin not only separates us from God, it separates us from one another. Until your husband can see his sinful heart and actions as damaging not only you but your marriage and is willing to actually do the work it takes to change them, it may be most Christ-like to stay compassionate toward him yet separate from him. There's one more thing. For your own peace of mind, please ask God to show you how to represent him well in this time. You must let go of your desire for everyone to agree with your decision to separate. You may be Christ-like in all your actions and attitudes, and people still may not like it. Jesus represented the character of God perfectly, and yet there were those, especially religious leaders, who did not approve.